Thursday evening: A few clouds. Temperatures in the 40s. Overnight Thursday: Clouds drift in. Lows in the 30s and calm. Friday: Mostly cloudy, sprinkles, overnight showers. Highs in the 50s. Clouds increase overnight as high pressure settles in to the southeast. Overnight lows will be in the 30s and low 40s with mostly cloudy skies through Friday afternoon and highs in the mid-50s. Our warm-up kicks in slowly Friday night into Saturday afternoon from a strong south wind. Scattered rain will move through Saturday morning and slip southward during the afternoon. The showers should break apart and allow for some clearing in the afternoon north of the Massachusetts Turnpike. High temperatures will likely be in the mid-70s with the sunny spots, around 60s under the clouds and farther south. The stalled front stays south for Sunday, with increasing clouds by afternoon and another approaching storm. Highs Sunday will still be mild in the 60s. The next Sunday, Monday storm is a tricky one to pinpoint track and timing, but the trend is that the precipitation moves through New England a tad quicker with a more northern track. 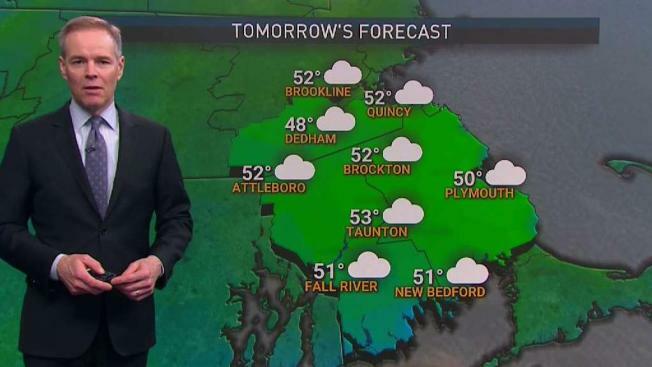 If this is the case, we will have most of the rain through by late morning on Marathon Monday and some dry weather with temperatures in the 60s by afternoon. The forecast models are not in agreement just yet on details, so this could still change. If the storm takes a more southern track, we will see more rain lingering through the race and temperatures in the upper 40s. School vacation week will be very seasonable with highs around 60 and some warmer days by the end of the week but also with showers. Dry days seem to be on Tuesday and Wednesday in the 10-day forecast.